Video still by Sabrina Ratte. The key to Moheb Soliman’s performance, Habib Albi is ... Not a Man, can be found in the artist’s statement published in the program notes. “In writing, I want to a salvage a self from the consuming dispositions of our socio-political environment, engage with other art forms that know better the phenomenal world, and reckon with language.” Indeed, considering that the performance is based explicitly on a set of poems, it seems almost weightless, intangible and only obliquely-engaged with any notion of a straightforward, linearly-defined world. It’s a performance that anyone currently engaged in performative literature should see. Far from the bombast of the slam stage and the void-filling language overkill of much spoken word performance, Habib Albi is ... Not a Man is a poetic performance that has learned to take its time, to occupy space with breath and silence as well as with sound. A Soliman poem is open-ended without becoming vague, and flows like a silk scarf slipping through a knothole, only to catch itself on a stray splinter – the slippage of meaning, of sense that is at the core of all language. 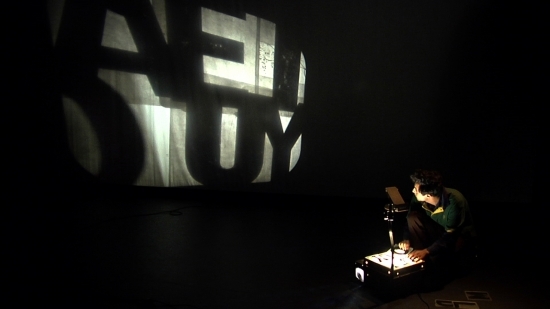 The performance begins with a video screening, animated by a much younger-looking Soliman sporting a mop of unruly hair and a slyly jihadi-esque beard. The video is fixed on a feature of Soliman’s youth in Ohio, the twin towers of the Budweiser factory whose dimensions and proximity to one another become a broad burlesque on the twin towers of the New York skyline. The younger Soliman literally ‘frames’ the towers in an ordinary wood-frame window with painted comments and ‘revisions’, accompanied by an English reading of a speech by Osama Bin Laden delivered around the time of George W. Bush’s second electoral victory (thanks to the swing vote in Ohio). The video is an audacious jab at the still-tender American psyche – yet the fearlessness, compassion and insistent questioning of the video in itself seems characteristically American – at least before 9/11 put fear in the hearts of so many. 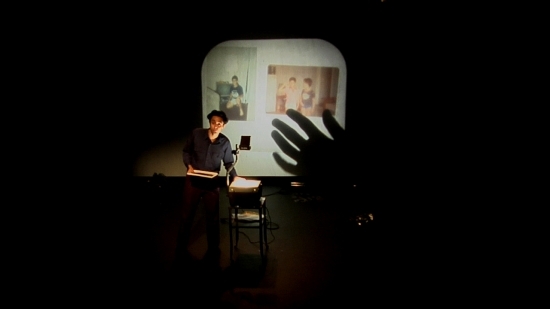 The stage presentation is sparsely minimal, and hinges on the gawky presence of a now-obsolete primary school fixture, an overhead projector. 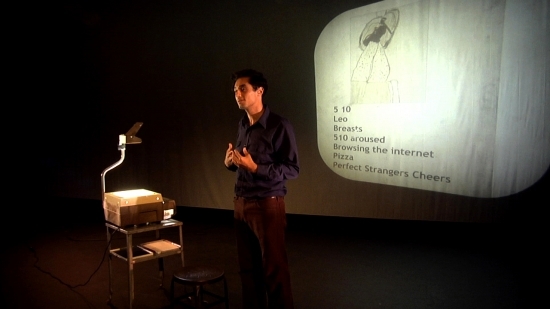 During the course of the performance, the overhead projector serves to project various texts and images, but it also takes its place as one of the iconic objects of the stage, along with a chair, a rickety gurney, a microphone stand (sans microphone), and the poet himself. One of the extraordinary aspects of Habib Albi is ... Not a Man is the way that the poems, which the author has stated explicitly were not written together as a thematic whole, flow from one to the next with a sort of sense-that-is-not-sense – maybe simply the resonance of the poet’s sensibility as it comes through each piece. ‘Not a Man’, among other pieces, is delivered in a strong Middle Eastern accent (modelled on the author’s father), and yet speaks, not of geopolitical concerns, but of much more postmodern-American concerns of gender and sexual identity. The effect is startling – disturbing, disconcerting, and funny as hell. Each piece serves to destabilize stereotypical images of types like ‘Arab-American’, and instead insist toward the individuality of the poet: the quirks and meandering paths of his imagination, the odd beauty of his experiences, as a child becoming ‘American’, as a young man celebrating friendship and passing the time as an all-night gas station attendant, as a grown man thinking through the implications of 9/11 and the new realities of ‘Homeland Security’. Habib Albi is ... Not a Man. 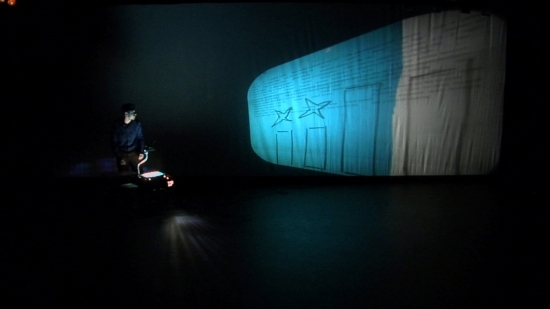 MAI performance space, September 16 and 17, 2011.